Hasbro has shared with us some official images following their Toy Fair 2014 presentation today. Here for your enjoyment now are official images of the Generations Leader class Jetfire – a very Generation 1 Jetfire / Skyfire inspired toy complete with detachable armor and optional faceplate. So when is the release date on that jetfire? Cause… Jetfire! I still cannot wait to find it and Roadbuster! I also like that it looks much more like a Valkyrie in alt mode, and the earlier Generations figure looks more like the alt mode from the show. Does anyone else think or hope that the nose is able to transform into a more show accurate, blocky looking section like in the show, as well as the more angular one showed? I know it is wishful thinking to hope for something, seeing as how it already looks like it includes SO much stuff already. Just my daily post of Windblade please!!! I think it was mentioned as 3Q this year. oh ok. so I have some time to get ready for that. thanks bro. anyone have a time frame on jetfire's release date? That road buster looks really good. I will have to get road buster for sure. He will look good next to whirl. I like this alternate modes for Jetfire,it is nice when display side by side with the Henkei Skyfire. Quite bluntly, no. That's not how I remember Skyfire at all. I thought, and still think, it was an extremely cool form. You're welcome to your opinion about what makes a better jet, but to insist that I should remember the other form as "ugly" et al… no, you're just wrong. I have my own memories and opinion about all that, and that's not the way to convince me I'm wrong. Wow you turned ugly quick man. I don't even see how your response was warranted at all but what ev. I'm not bothered by Jetfire's "fake" canopy too much. I just wish they'd gone all the way toward giving us a show-accurate "Skyfire" in both modes. I don't really care about the old-style Jetfire jet mode. 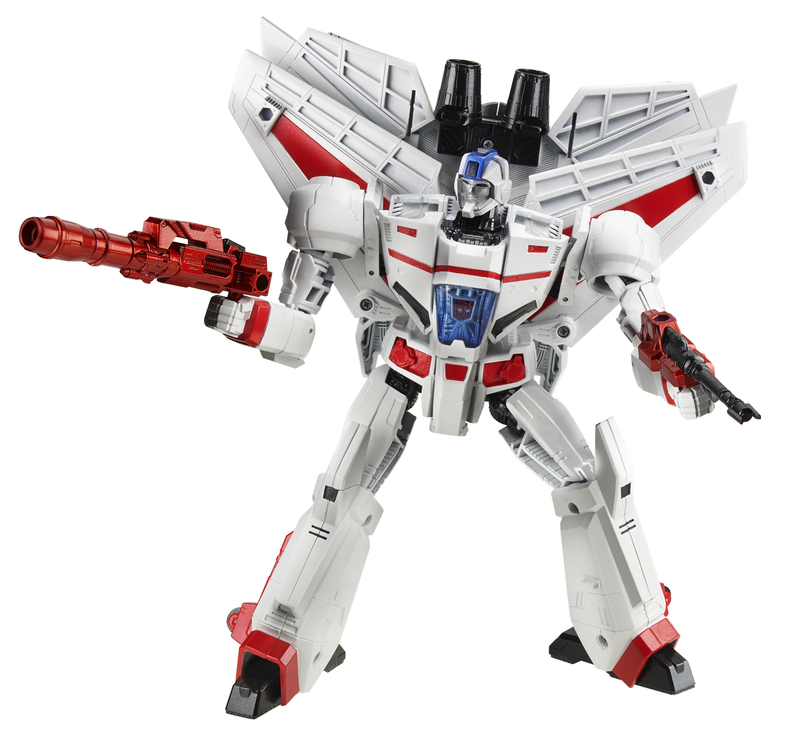 We've never gotten a Skyfire-style jet, and when we get such a nice homage here in robot mode… they only go half-way? That's just weird. I prefer it this way myself, Though I can see why some prefer the toy go full cartoon. Cartoon Jetfire looks too much like a flying packing box fort for my taste. originally sometime this month, but I'm betting April online and May in brick and mortar with the movie figures. Sorry, but does anyone know when approximately Windblade is coming out? I am so excited about this one, want to repaint one of them into a Dino scheme, and I think she looks perfect for this (will keep one with standard colors too, maybe just add some detailing). Looking forward to the other fembots too from Hasbro, hope they make it out in 2014 and not get delayed because of the movie. I enjoy both alt modes for Jetfire and Skyfire. It is a tough choice, as the Skyfire alt mode which struck me as some strange double decker jet-shuttle research vessel has never been done in toy form before. However the Jetfire VF-1S mode is very iconic and a great looking figure. One thing that made me curious is that the top deck of Skyfire looks as if it could separate and act as a science drone of some sort. 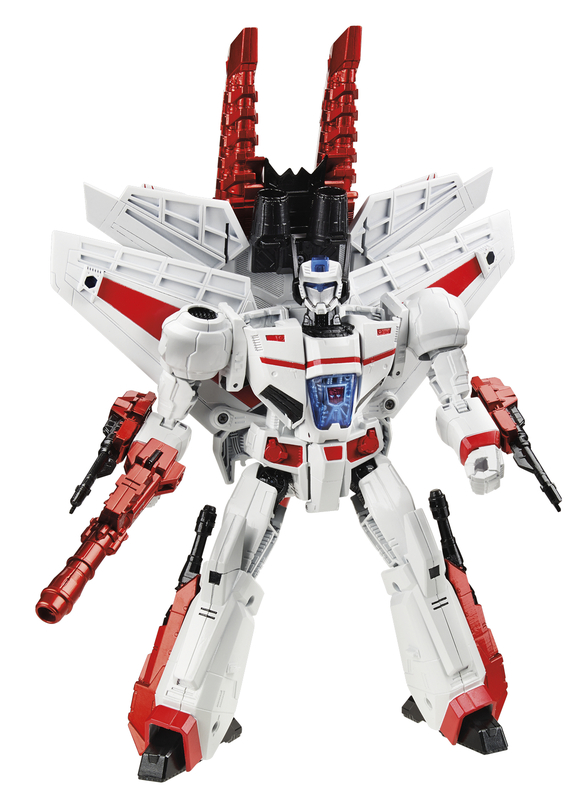 Since the super booster/cannon backpack separates I sort of envisioned Skyfire at some point swapping between the more military grade backpack and the more research grade backpack. While not perfect, a third party add on that clips on the same way as the toy backpack might be an interesting compromise. That's an extremely defensive response for a harmless comment. I've seen this sentiment several times, and I suppose I can understand it for huge fans of the show character, but do you remember how ugly, boxlike and ungainly the Skyfire jet mode was? Compared to the sleek, deadly and faster than hell looking Jetfire toy jet it was just a cargo transport. Frankly, they did it right with this one. Can't wait to see Megatron. Just something I like to point out in regards to Jetfire's "fake" canopy in jet mode. It seems Hasbro wasn't to off the mark with it in regards to real jets. Both Roadbuster and Sky-byte are hands down mine.